The nation has made huge strides in decreasing its carbon footprint. A new study reveals that the UK’s efforts to decreases its carbon footprint are working. 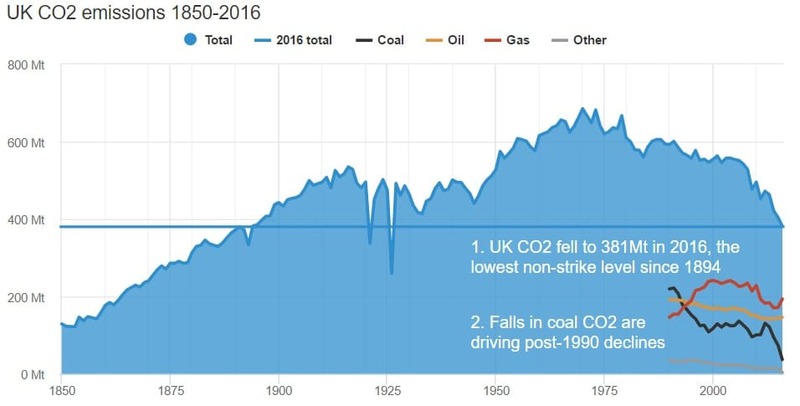 The report from the non-profit Carbon Brief shows that carbon dioxide (CO2) emission levels in the UK are now at their lowest since the 1920s. The UK achieved this drop by adopting a multi-pronged approach that includes shifting away from coal, expanding energy efficiency programs, decreasing energy demand, rapidly growing renewable energy sources, taxing coal carbon, and burning more natural gas. In the past 10 years, coal use has dropped by 74 percent in the UK. According to Carbon Brief, this has helped to lower CO2 emissions levels to 36 percent below the 1990’s level. From 2015 to 2016 alone, coal burning emissions dropped by 50 percent, causing total emissions to fall by 5.8 percent. This was fueled by the closing of large coal users during that time, like Redcar steel in 2015, and three power plants in 2016. Renewable energy sources are experiencing exciting innovations all over the world. These kinds of advances are enabling the UK — and others — to lower Greenhouse Gas emissions and fight climate change through the use of green energy. An increased reliance of green energy may also save lives that are being threatened by air pollution, heavy metals in water, oil spills, and natural disasters, which are linked to non-renewable energy sources. Many countries are making strides towards renewable energy. In February, Denmark generated enough wind energy to power the entire country for the day thanks in large part to a new offshore wind turbine installation. Iceland is about to take its use of geothermal energy to the next level by drilling into a volcano for clean energy. In 2016, renewables accounted for 90 percent of the new power used in the EU. Asia has also been stepping up its green-energy game. India is now home to the largest solar power farm in the world, which covers 10 square kilometers (over 6 square miles) and has a 648 MW capacity. As of February of this year, China was the largest solar power producer in the world. China also announced that it will begin implementing an electric taxi program in Beijing this year, targeting the city’s 70,000 existing cars. Closer to home, real progress is happening in states that back clean energy. As a result of a $1.5 billion investment, New York State increased its solar power usage by almost 800 percent over the past five years, from 83 MW in 2011 to 744 MW in 2016. Since the price of generating solar energy has dropped 58 percent in the past five years alone, it is a great investment for states to make. Now that states and countries can see that making these transitions can make a measurable, positive impact on our environment, they may be even more motivate to invest in clean energy.